today’s verse comes from Psalm 130:5-6 sometimes i take the time to go back to my junior high days of writing in bubble letters. (and really, who doesn’t? haha) the bright colors really make me feel grown up too. but seriously, this is my verse for today, this week, who knows, maybe even month. i’ve been feeling so dry, so alone in my walk with God lately but deep down i know that i must just wait on the Lord. i’m hoping that taking the time to write it out will help me to memorize it. that it may be more real to my heart if i just hold on tight to it’s words. this morning i finally had my first quiet time in days… weeks really. sometimes i get out of the habit of reading my bible and then i wonder why i feel so dry. um, hello? how thick headed can i be? this verse even says, “in His WORD i hope” it means i have to actually be in the Word… to have the hope and to wait for the Lord. i’m not exactly sure what i’m waiting for, but i think i’m waiting for Him to meet me, to provide, to be my everything. so i wait. my soul waits more than watchmen for the morning. then i heard this song that i haven’t heard in a while. “all i can say” from David Crowder… it’s an old one but so good. listening to it it hit me how much this is me at the moment. i feel so alone and sometimes i think, come on God, “don’t you see me crying? did you hear me call your name? wasn’t it you i gave my heart to? i wish you’d remember where you set it down.” and i don’t know what else to say. i don’t know what else to pray. but just saying that, just saying the truth and giving my “everything” is all God asks. i may feel alone, but it doesn’t do any good to hold it in and not come to God with it. but then i love the last verse of the song: “i didn’t notice you standing here, i didn’t notice you holding me, i didn’t notice you were crying too, i didn’t know that was you washing my feet.” God just asks you to come to Him. He’s there the whole time. He’s holding you and crying with you. He’s “washing your feet” like Jesus washed the disciples feet. He’s there. 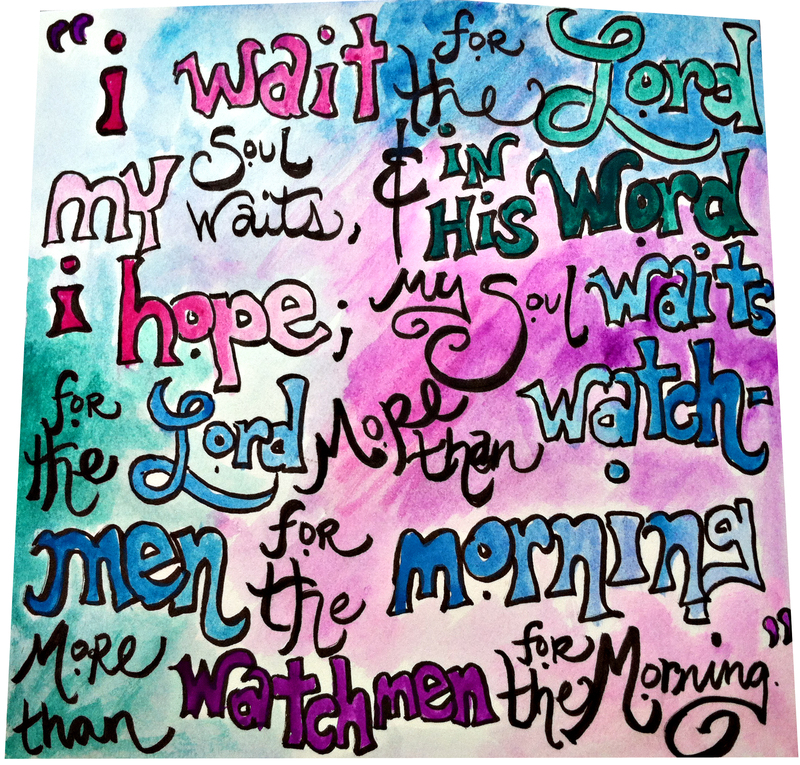 so i wait for the Lord and hope in His word and promises. my soul waits like the watchmen wait for the morning.